Ms. Amy Hankins consistently demonstrates deep support for the students of Seward schools. She has served on the Seward School Site Based Council and is currently serving as the Arts Chair on the board of the Seward Parent-Teacher-Association (PTA). In addition to serving on the PTA board, Amy generously offers her time and talents as the chair of the PTA’s Arts committee. This committee is charged with making the arts available to Seward area students. Last year, Amy spearheaded an 18 month effort to bring Jabali, an African dance troop, from Mombasa, Kenya, to Seward. She coordinated all aspects for this production, including fundraising, PR, ticket printing and sales, transportation and lodging, so that this cultural extravaganza could be enjoyed by the community of Seward and all three Seward schools, along with students from Connections Homeschool and Moose Pass School. This year she spearheaded Scrap Arts music to come to Seward in April 2016. Amy also has a passion for technology. In 2013, Amy joined with two other staff members to lead a community-based computer programing club for youth aged nine to 18. The Seward Community Library and Museum generously hosts club meetings and activities. Amy’s work with this group eventually evolved into her work with Lego Robotics in the schools. Amy works with two Lego Robotics groups in Seward: one meets after-school and one meets during school. The after-school Lego Robotics team, comprised of Seward Elementary and Seward Middle School students, and a homeschool student, met last year to learn to build and program Lego vehicles to perform specific tasks. Co-coach Leigh Ray said, “Amy leads the club by exuding enthusiasm for coding and robotics, which helps the kids get unstuck when the programming gets tough! She is becoming a very accomplished robotics programmer herself!” In 2015, the team competed in the first Lego League regional competition in Anchorage. They were then invited to return and compete in the state championship. At the end of the regional competition in Anchorage, Amy received the Coach Award for her excellence in coaching. At Seward Elementary, Amy introduced Lego Robotics during the 2013-2014 school year. She worked with approximately 55 second grade students, teaching building and programing skills. This year, she has continued the program with the same students, who are now in third grade, as well as teaching it to all of the current second graders. Students enjoy the challenge of building and coding. Second grader Van Shank says, “It was fun programing the computers. Mrs. Hankins did a really good job.” In addition, Amy began training a teacher to continue the program as the current third graders move up a grade. 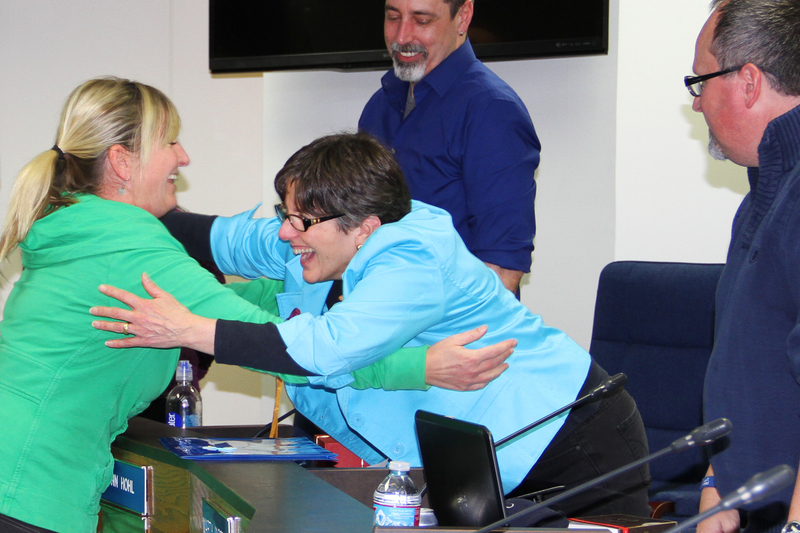 “We value the way Amy looks for opportunities to enhance the education of all students in Seward through her ongoing dedication to the arts and technology,” said Principal David Kingsland. 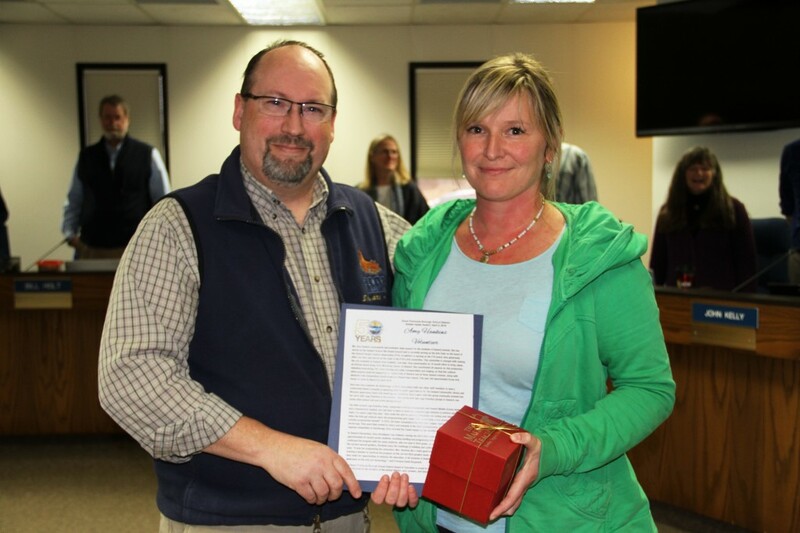 The Kenai Peninsula Borough School District Board of Education is proud to recognize Ms. Amy Hankins for her dedication to the students of the school district, past, present, and future. Ms. Rankin was nominated by Principal David Kingland, on behalf of Seward Elementary School. This entry was posted on April 4, 2016 at 8:08 pm. You can follow any responses to this entry through the RSS 2.0 feed. You can skip to the end and leave a response. Pinging is currently not allowed. 2 Responses to "Community member Amy Hankins receives Golden Apple"
Amy, I am so proud of who you are, you inner beliefs in our children and who they can become and your selfless non-stop giving. You have proven yourself to be an excellent teacher and mentor to so many and above all a gifted, talented and inspirational model to so many students!! Thank you to Mr. Kingsland for being on the ball, and nominating the perfect person for this award! !